Little Pax is a late-season English dessert apple. The apples usually ripen in October and will keep in a refrigerator or cold shed well into the new year. Although discovered only recently, its pretty bell-like "pearmain" shape, and speckled red-flushed skin are very reminiscent of the classic 19th century English apples. The rich sweet aromatic flavours also hark back to the Victorian era. The flesh is crisp but not dense, so this is an easy apple to eat. Little Pax is also characterised by its unusually prolific spring blossom. Little PaxTM is a trademarked variety. Please fill in the details below and we will let you know when Little Pax apple trees are back in stock. Denser and crisper than Little Pax, but worth considering if excellence of flavour is your main requirement. Little Pax is in flowering group 3. Little Pax is self-sterile and needs to be pollinated by another tree of a different variety nearby. Since it flowers in the middle of the blossom season it can be pollinated by most other apple trees. 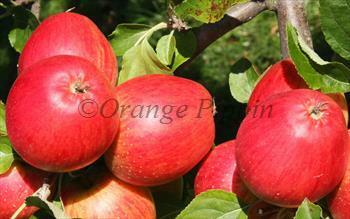 Little Pax is easy to grow, but as might be expected from an apple variety from the Isle of Wight, it likes a long growing season to achieve its attractive red colouration. This is a naturally productive variety, and as a result fruit size can tend to be small - this is easily addressed by thinning the fruitlets at the end of May after the blossom has finished. Little Pax was planted as a seedling tree in the gardens of St. Cecilia's Abbey, Ryde, Isle of Wight. Its parentage is unknown, although it displays the typical bell-like "Pearmain" shape associated with several Victorian varieties such as Adam's Pearmain.